Is Social Media Going to Kill Email? The phenomenal rise of social media has, without a doubt, created a wave of excitement in the online marketing industry. It has never been as easy to share information online and to connect with like-minded individuals as it is today. Social networks such as LinkedIn, Facebook, and Twitter are changing the way we as individuals, and as businesses, communicate. A study by the advertising research company Nielsen showed that nearly 25% of the time Americans spend online is spent on social networks, an increase of 43% over the previous year. Analysts and marketers are naturally faced with the question of how to incorporate these new mediums into an effective marketing strategy. 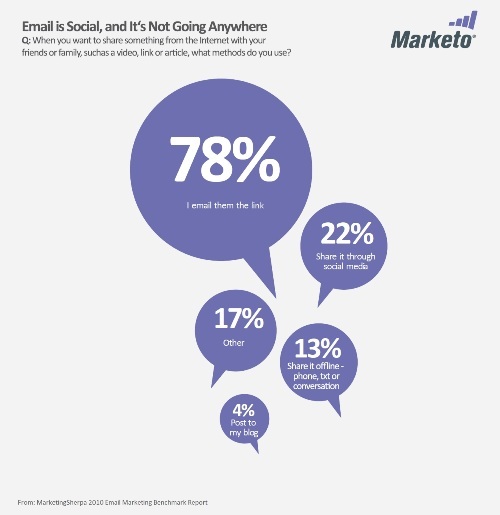 Will B2B social media communications replace email marketing? Can email, long seen as one of the established staples of online marketing, survive? The short answer is: yes, email isn’t going anywhere yet. Social and email can comfortably co-exist, to a point where they work in tandem. Here are five reasons social media isn’t going to kill email. 1. Email is the preferred communication medium in business. Confidentiality and security are especially important in business. Could you imagine sending an internal financial statement via Facebook or LinkedIn? It’s true that teenagers are increasingly turning to text, and Facebook messages to communicate. They use email less, and do indeed see it as outdated. But privacy and confidentiality doesn’t yet have the same meaning for them, and it is likely that they will adopt at least some of the current business communication mediums when they enter the workforce. 2. You need an email address to connect to social networks. Email has been described as the glue, the common denominator of all online social networks. It’s virtually impossible to create an online profile without providing an email address. And although technologies such as Facebook Connect may grow in prevalence, email is still a default means of access to your online destinations. 3. Email is social too. One of the most popular ways to share content with friends or family is to send a link via email. Here we see a true synergy between social networks and email, where we find interesting content, and then share it with those closest to us. It’s true that social media has reinvented the concept of ‘sharing’, but the path a message takes is long and complex. And chances are high that somewhere along the line, email plays a role. 4. Mobile and email work well together. The same Nielsen study referenced above, shows that email is the dominant activity on mobile devices, and the trend is increasing. Of every hour spent on a mobile device, an average of 25 minutes is spent with email. And this effect will be further amplified as mobile usage increases, both business and personal. 5. Email can deliver targeted and relevant content. Advancements in email marketing and marketing automation systems now allow marketers to reach individuals in their audience / network with hyper-relevant and timely messages. Gone are the days where everyone in your database gets the same message, on the same day. It is much more effective to reach out to an individual with customized, personalized and well-timed content. Strategies such lead scoring, lead nurturing, and smart campaigns are now part of a world where email marketing has evolved to become more nimble, measureable, and ultimately, more effective.